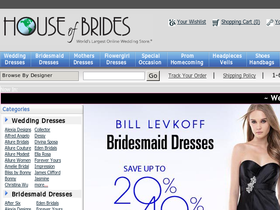 Shop House of Brides online at HouseOfBrides.com for the oldest and most trusted bridal name in America. House of Brides carries a comprehensive bridal product selection featuring wedding dresses, couture wedding dresses, plus size wedding dresses, informal wedding dresses, hot red wedding dresses, bridesmaid dresses, maternity bridesmaid dresses, flower girl dresses, prom dresses and much more. House of Brides offers their customers the same designer collections found at more expensive bridal shops for much lower prices. Be sure to check back with 58coupons.com for the latest House of Brides savings, House of Brides promotions, House of Brides sales and House of Brides coupons for HouseofBrides.com. Take $50 off orders of $400 or more from HouseOfBrides.com with this code. Act now for a great selection of discounted Wedding Dresses from House of Brides. Click link to view. Take an additional $20 off on Wedding gown Preservation kits from HouseOfBrides.com. Enjoy free shoes with your order of any bridesmaid or special occasion design order from Houseofbrides.com. Make your own Wedding website with ease with the HouseofBrides.com Free Page Maker. Click link to check it out and get started.